It is often said that information is power, so with all that is happening in our city right now, we will be brining you more regular updates so you are better informed on what is happening. We would also like to know if you have any information that you would like to share. Feel free to drop me a line and let me know what it is. Events bring more people and with more people you have more opportunities to capture their spend. We are very excited the Christchurch Lantern Festival is back into the Central City. 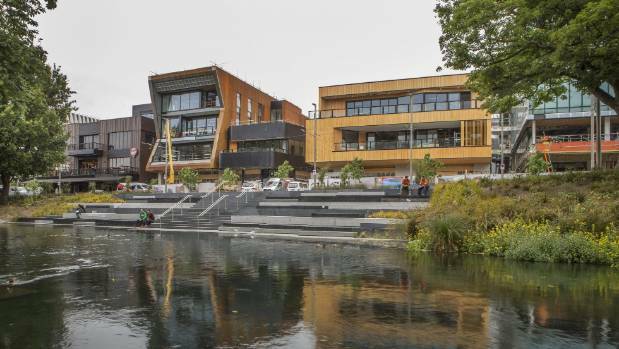 The new site includes the Ōtākaro Avon River Precinct, Wilsons Car Park site on Worcester Street and Cathedral Square. Due to the Wilsons Car Park site on Worcester Street being used for the festival, it will be unavailable for parking from 5th-14th March. Please check www.wilsonparking.co.nz to find an alternative car park during this time. For the first time ever all 8 Golden Oldies sports will be held in the same city and in the same month. The Sports are; Basketball, Cricket, Football, Golf, Hockey, Lawn Bowls, Netball, Rugby, Softball and Squash. This event will bring approximately 5,000 participants plus their support crews and followers. Do not under estimate the spend this will bring to the city. Access and Parking Made Easy! 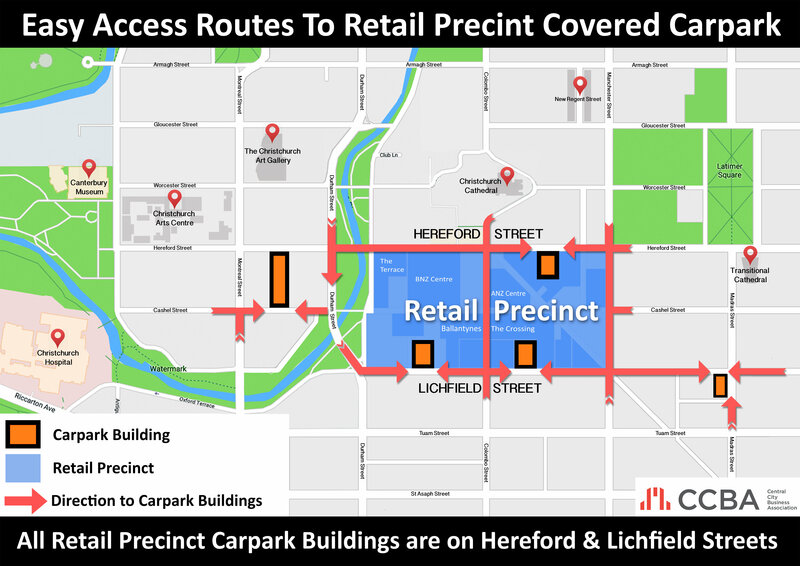 Below we have created an easy to understand map of the major off street car parking buildings in the Retail Precinct and how your customers can access them. 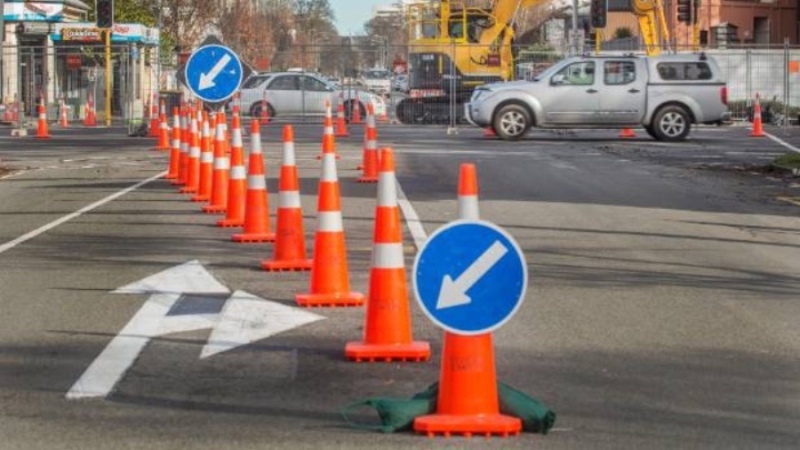 There is a big push from Ōtākaro to finish their road way project works before winter is here. You can get access to updated information on all road working projects that are happening on our website. The Terrace has opened its first bar! Botanic open their doors on the 16th February which is the first of many that will open in the coming months. Make sure you come down and check it out as this is the first of many that will be opening along the Terrace in the coming months. A big thanks to Boardertown and Black Sheep Rentals for taking up the opportunity to place some of the Urban Sheep in their shop windows. We are always looking for content for our Facebook so we encourage you to use it. If you have promotions or something special coming up, please let us know. Send me through the details including any images, so we can help you promote your business. My details are listed at the bottom of this newsletter. We would also like to remind our members that we offer the opportunity for you to update the content on your webpage. You may have new seasonal images or new product that you want to promote. Again, please send me the information so we can update your page and keep it fresh.